Looking back, you recall your attempts to explain your “bicycle vacation” to your friends and family. It wasn’t easy trying to get them to understand what this was really about. But now that you’re well on your way, it would be so simple to express to them that feeling of simultaneous freedom and connection achieved while voyaging by bicycle. Your whole world is packed up on your bicycle and the people you encounter along the way sense this and naturally want to be a part of the experience with you. Today begins a new chapter of your journey. You’ve spent the last few weeks riding through familiar places. But today, you’ll cross a border to begin your adventure into the unknown. You’ve planned this trip for months and you chose a set of Ortlieb’s Front Panniers for the front-end of your touring rig. Your bicycle looks rugged and ready decked out with Ortlieb’s front and rear. And you’re fully prepared for the adventures ahead with all of your essentials snugly packed away in your waterproof and adventure-ready Ortlieb panniers. Q: What differentiates the Sport Roller Classics from Ortlieb’s other front panniers? Fits rack rails from 8mm to 16mm diameter. See the QL2.1 mounting instructions. The hook positions are easily adjusted without tools for optimal placement on the rack’s upper rails. More forward placement is better for weight distribution, but rearward positions may be necessary for heal clearance. Quick-lock hooks open automatically by lifting the pannier handles for easy one-handed removal. Includes anti-scratch hook inserts for 8mm, 10mm and 12mm rails. Optional 20mm QL-2.1 Top-Hooks – E193 are available for over-sized rack top-rails. Rails integrate with the Ortlieb Pannier Security Cables-Short for locking to your cargo rack. The semi-elliptical shape of the lower hook rail allows for optimal positioning for secure and easy attachment. The lower hook position along the rail and orientation (in 15 deg steps) is easily adjusted without tools. An additional lower mounting hook can be added on for extra security of the panniers in rough conditions. Used on the black panels. Highly durable, pvc waterproof inner layer. The roll closure gains its stability and waterproof quality from the thin plastic stiffener bars sewn into the upper end of the material. The unrolled material extends 28cm / 11″ from the upper hook rail. For maximum capacity while maintaining waterproofness, a minimal 3 rolls leaves 18cm / 7″ of fabric extended. A center strap provides additional support for sealing the closure. A Rack Pack Medium or Small can be mounted across the top of the pannier. The center straps can connect to the Rack Pack’s straps to secure it in place (A strap over the center of the Rack Pack is also recommended). The rolled closure straps integrate with a 69cm / 27″ shoulder strap. A low strap hook secures the position of the shoulder strap for sealing the closure. Utilizing the shoulder strap closure method allows for a flatter top-of-pannier surface for mounting a Rack Pack. Alternatively, the shoulder strap closure doesn’t need to be used and the rolled closure straps can buckle to each other to seal the closure. 6 = Dust proof, no penetration of dust. 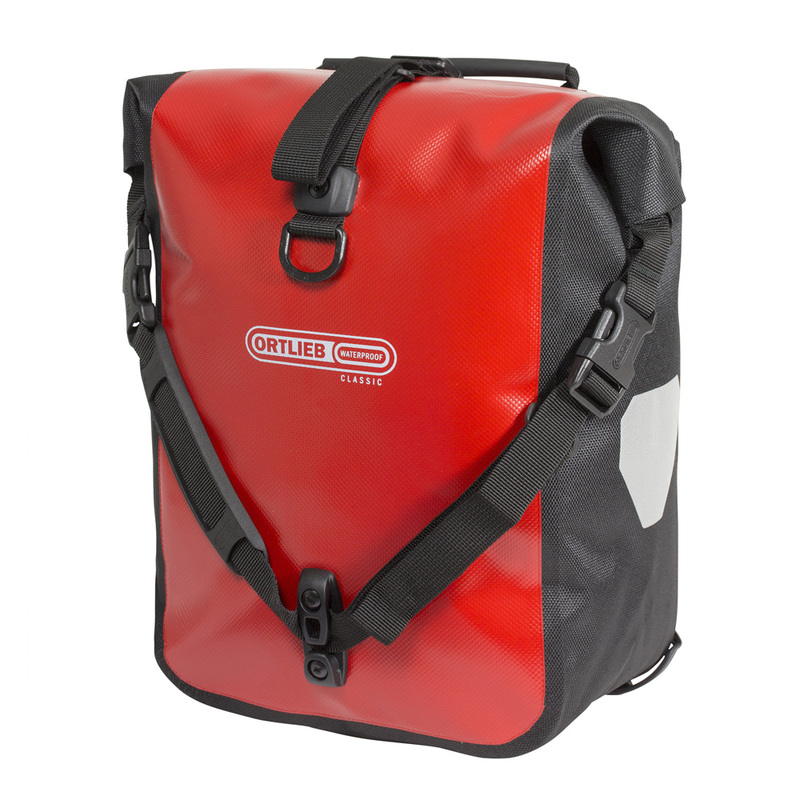 Includes two shoulder straps for carrying the panniers away from the bicycle. Shoulder straps integrate into the roll closure system and allow for a fast transition between cycling and off bike modes. Highly reflective 3M Scotchlite patches measuring 8cm x 8cm / 3″ x 3″. 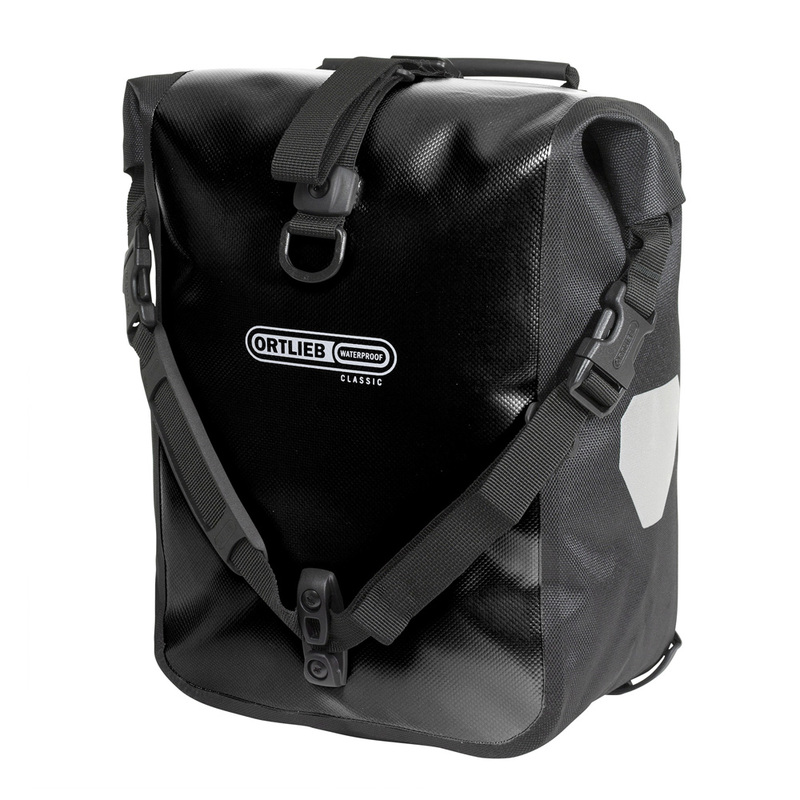 Positioned on the front and rear of each pannier for forward and rearward visibility. Main pocket is open without a closure. Measures 30.5cm / 12″ tall and 32cm / 12.5″ wide at top and 23cm / 9″ wide at bottom. Secondary mesh pocket has a zippered closure. Measures 13cm / 5″ tall and 32cm / 12.5″ wide. Lower edge protector with slots for mounting to the Ortlieb Carry System. Creates a stable bottom so the pannier can be set upright on the ground. Typically used as rear panniers but can also be used as large front panniers. So far excellent panniers. Everything I expected and more. Quite durable and it shows.